The elegant sword cane is similar in appearance to our City Stick and comes with a removable 300 series stainless steel head so that it can be engraved and personalized if you so desire. The result is a very appealing cane with an extra strong partial crook handle made from Grivory, with a black, aluminum shaft that's 2mm thick and heat-treated for strength. The shaft is handsomely tapered and capped with a thick rubber ferrule for better traction on slick, icy sidewalks or uneven terrain. Not legal for sale in the state of California. Why change something if it works? 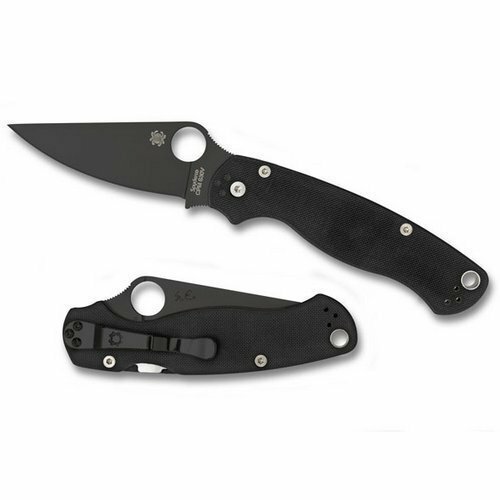 Because at Spyderco we practice the principle of C.Q.I. – Constant Quality Improvement. If we can refine and improve the ergonomics or cutting performance of an established model we do it. Our 2010 Para-Military2 has several changes over the classic version. The G-10 handle is narrowed at the end improving the ergonomics. The handle and blade have been profiled thinner; removing ufortable angles when in the closed position. It features a Compression Lock and an ambidextrous-friendly four way clip which carries tip-up/tip-down left/right-hand and rests deeper in a pocket. We kept the same high-performance CPM-S30V full flat-ground blade but we’ve also lengthened the blade’s tip and added additional surface jimping to both the spine and finger choil. Implementation of a new Bushing Pivot System generates fluid action and more consistent manufacturing tolerances. Larger lanyard gives more options for carry. Refinements to overall construction may not be drastic or even visible to the eye but from the G-10 textured handle to the CPM-S30V steel full flat blade everything is sharper smoother and guaranteed to provide performance and userfort. Blade Length: 3 7/16″ (87 mm)Cutting Edge: 3 5/64″ (78 mm)Blade Thickness: 9/64″ (3.5 mm)Overall Length: 8 9/32″ (210 mm)Closed Length: 4 13/16″ (122 mm)Hole Diameter: 9/16″ (14 mm)Blade Steel: CPM-S30V Premium Stainless SteelWeight: 3.75 oz. Handle Material: G-10Made in Golden Colorado USA.